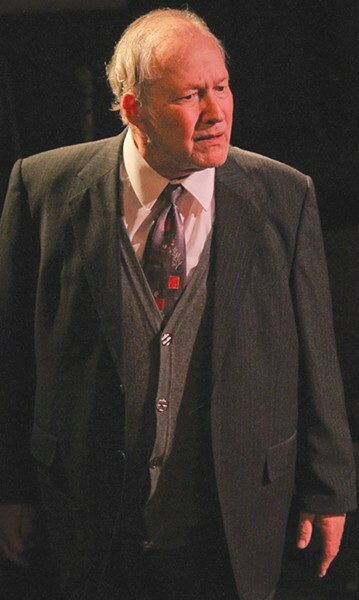 AMERICAN DREAMER Veteran of TV, film and theater roles Charles Siebert commands the stage as the tragic Willy Loman. Film, television and theater veteran Charles Siebert headlines the 6th Street Playhouse production of Arthur Miller's Death of a Salesman. Miller's Pulitzer Prize- and multi–Tony Award–winning treatise on the elusiveness of the American dream is considered by many to be the greatest American play ever written. Nearly 70-years-old, in the hands of the right artistic team, Death of a Salesman can seem as fresh as ever. Director Craig Miller has assembled that team to surround Siebert's towering central performance as Willy Loman, a traveling salesman whose days on the road are rapidly coming to an end. Frustrated at still living paycheck to paycheck at his age, Willy is coming unraveled, to the consternation of his wife, Linda (Sheila Lichirie), and son Happy (Ariel Zuckerman). Things aren't helped by the return of semi-prodigal son Biff (Edward McCloud). The action glides between the present and the past and between fantasy and reality as we see how Willy's dreams for his boys and himself have come to naught. 6th Street's Studio Theatre setting brings a level of intimacy to the show that makes Willy's downfall, Linda's helplessness and Biff's acknowledgement of his own failures even more gut-wrenching. In a very strong ensemble of North Bay regulars, take note of Bay Area newcomer Zuckerman's performance as the son most like his father. If political drama is more to your liking, then the scrappy Redwood Theatre Company is presenting Farragut North by Beau Willimon (Netflix's House of Cards). Willimon turned his time as a press aide during Governor Howard Dean's 2004 Presidential run into this tale of the inner-workings of a similar campaign. 'Death of a Salesman' runs Thursday–Sunday through April 28 at the 6th Street Playhouse Studio Theatre, 52 W. Sixth St., Santa Rosa. Thursday–Saturday, 7:30pm; Sunday, 2pm. $18–$28. 707.523.4185. 'Farragut North' runs Friday–Sunday through April 22 at Redwood Theatre Company, 440 Moore Lane, Healdsburg. Friday–Saturday, 7pm; Sunday, 2pm. $15. 707.495.9741.